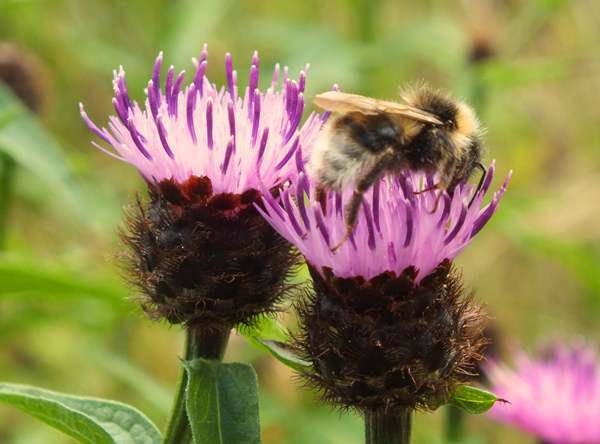 Equally well known as Black Knapweed, notably in the English Midlands these thistle-like wildflowers are also referred to as Hardheads, because the buds and flower heads are firm and solid. 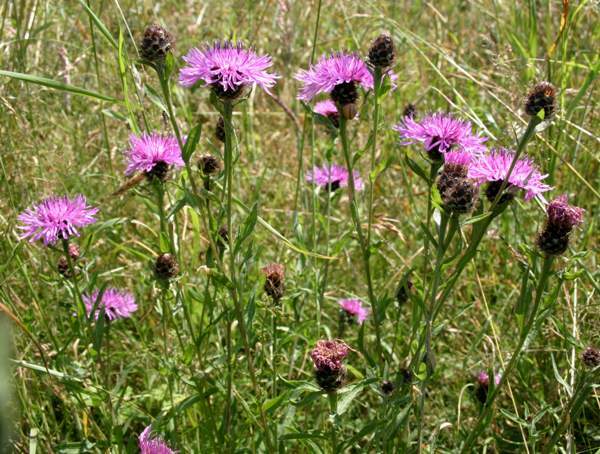 A hairy perennial with stiff erect ribbed stems, Common Knapweed grows up to a metre in height and its upper part branches freely. Knapweeds are readily distinguished from thistles by the absence of spines and prickles. 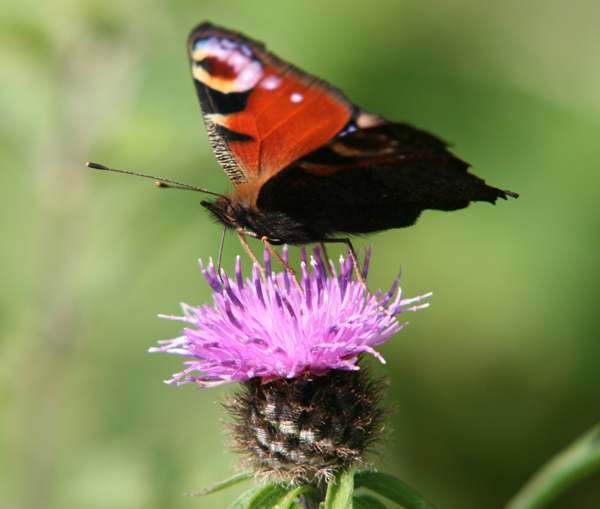 Common Knapweed leaves are dull green and finely hairy, but in other respects they vary greatly. The upper leaves are usually narrow and entire (without lobes) and untoothed, while the lower leaves are sometimes lobed and have coarse teeth. Very common throughout Most of Britain and Ireland except for the far north of Scotland, where it is an occasional find, Common Knapweed is a European native species that has been introduced to many other parts of the world including North America, where it has in places become a nuisance weed because it so easily invades places where the soil has been disturbed. Common Knapweed grows wherever grass is not closely cropped. It is often abundant beside lakes and streams in southern Britain, especially where grazing animals have been fenced off from themargins. 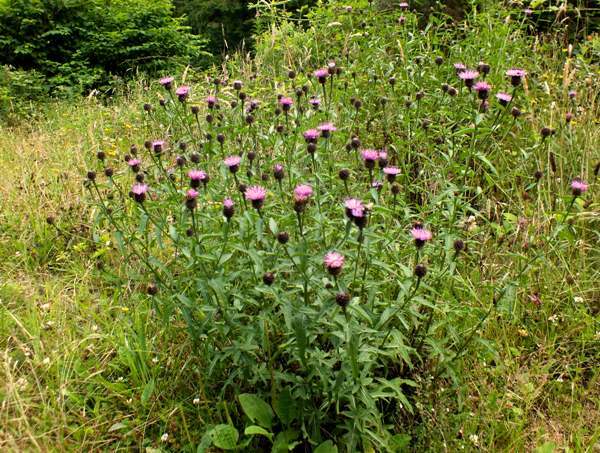 In Britain and Ireland Common Knapweed flowers first appear in June and continue into September. Insects, including bees and butterflies, are very fond of these long-flowering plants. Seen on the left is a Six-spot Burnet Zygaena filipendulae which, in central and southern Britain in particular, is a common sight on the flowers of Common Knapweed Centaurea nigra and other members of the Centaurea genus. Centaurea, the genus name, comes from the Centaur Chiron, who used flowers of this genus as a poultice to cover a festering wound made by an arrow dipped in Hydra's blood, The wound was cured and so, the story goes, cornflowers and knapweeds were given the name Centaurea. The specific epithet nigra means black.